To be earnest, is to show depth in sincerity and feeling, and in a world of increasing cynicism and negativity, it is an exceptionally important characteristic. Though singing is sometimes considered a vain pursuit, nothing could be further from the truth. In order to truly convey the emotional range and depth of a musical piece, a singer’s ego must be completely subsumed. This is even more true in a choir, where there is no one important singer; just many voices, blending to sound as one. Singing earnestly requires complete commitment to the piece of music, and to communicating the emotional breadth of that piece. To be earnest, requires a certain vulnerability, that be hard to access while in our difficult teenage years, and even more difficult to access during a performance, when we are acutely aware that all eyes are on us. Still, the ability to sing with earnestness, is what allows us to truly connect to music. It gives us permission to put aside what we are personally feeling in order to communicate the emotion conveyed in the piece. Singing earnestly allows us to show how much we enjoy and are moved by music, without fear of judgement, or reproach. Earnestness, while it can feel vulnerable, is instead, the most freeing of emotions, and is an essential aspect of truly moving music. 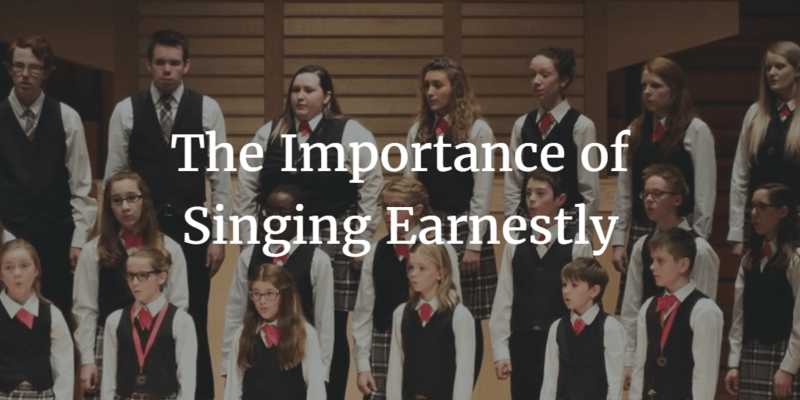 Why do you think it’s important to sing earnestly? Tell us in the comments below!